1. Niki de Sainte Phalle at the Atlanta Botanical Garden, June 2006, originally uploaded by Frankphotos. 2. 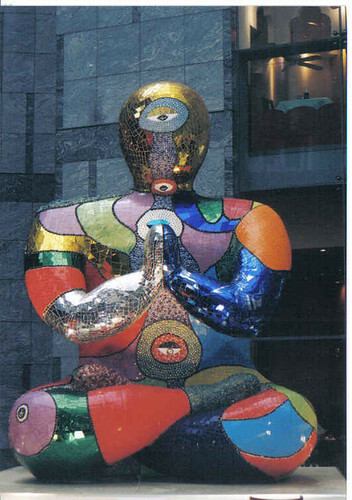 Niki de Sainte Phalle at the Atlanta Botanical Garden, June 2006, originally uploaded by Frankphotos. 3. Niki de Sainte Phalle at the Atlanta Botanical Garden, June 2006, originally uploaded by Frankphotos. If you cannot physically access Niki de Saint Phalle’s sculptures in Atlanta, then check out Frankphotos’ wonderful Niki de Saint Phalle photoset. Buddha, originally uploaded by purplecosmid. Or at least she did prior to her death in 2002. One look at this and it screams Niki. Sure enough I managed to find that this "Buddah" was in Japan in 2003. It was created in 1999. The Japanese love Niki's work and there is a Niki Museum in Nasu. "Whenever I think about human beings, I am convinced that We have everything within. Conscience, creativity, stupidity, devil and god"